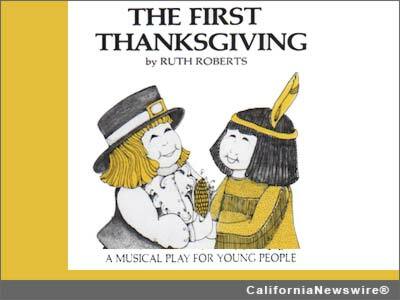 LOS ANGELES, Calif. /California Newswire/ — It's never too early in your child's development to talk turkey – to teach them the meaning of the Thanksgiving holiday – and Ruth Roberts Music is making it fun with the release of "The First Thanksgiving," a collection of sing-along songs, all newly digitized and available on iTunes. The album contains 10 tracks – five song performances and musical accompaniment for each of the songs. Titles include "Over the River and Through the Woods," "Picture Talk," "A Pilgrim Thank You Song," and "Come, Ye Thankful People." All songs are appropriate for children in grades K-through-6. "The album's songs were adapted from the Native American young people's musical, 'The Legend of the Twelve Moons'," states Susan Nicoletti, Director of Operations for Goldenrod Music and Michael Brent Publications, the publishing companies that oversee Ruth Roberts' songs. "The idea behind Thanksgiving is told in a story called 'Small Paleface and Bright Squirrel' as they find the true meaning of brotherhood and friendship by learning each other's customs," Nicoletti says. "These songs can be used at home or in schools since they're all 'G-rated,'" Nicoletti states, referencing her five years as a member of the ratings board for the Motion Picture Association of America (MPAA). Roberts' love songs were recorded by Dean Martin, Debbie Reynolds, Theresa Brewer, Jimmy Dean, The McGuire Sisters, Patti Page, Vic Damone, Arthur Godfrey, Steve Allen and Eydie Gorme." Her songs appear in "Yes Man," "The Benchwarmer," "A Dirty Shame," "Everybody Loves Raymond," "Seinfeld," and Conan O'Brien. In addition, Roberts created miniature musicals for schools. "Teachers and educators are continually rediscovering the many easy-to-stage musicals written by Ruth Roberts," states Nicoletti. "These collections are also popular with teachers and parents of special needs children," Nicoletti added. More Information: For more about Ruth Roberts and her music for kids, families, schools, special needs organizations, and sports fans, please visit http://www.ruthrobertsmusic.com/ and for an interview with Susan Nicoletti, please contact John Scott G of G-Man Marketing (818-223-8486). Video of "The First Thanksgiving" http://youtu.be/lYwoZ4zbf_A .